The holidays are right around the corner and it’s time to think about what gifts you want to get for all the special people in your life. Perhaps your daughter, daughter-in-law, or best friend became a new mom this year and you want to get her a gift that is both thoughtful and sweet? If you’re looking for that perfect holiday gift for the new mom, consider these fantastic eco-friendly products, which you can find at eco-friendly retailers across the country and online. Siliconies by Family Bedrock: Siliconies creates beautifully designed jewelry pieces made from food grade soft silicone. Why is making jewelry from food grade silicone important? Siliconies is not only designed to be a fashionable, stylish piece mom can wear, but also a piece that her baby can enjoy too. Yes, that’s right, babies can safely put a Siliconies pendant in their mouths and enjoy a soothing teething experience. Mom looks good. Baby feels good. This is a win-win gift if there ever was one! Get it at Abby’s Lane. Earth Mama Angel Baby: Earth Mama Angel Baby has created a wonderful line of organic products for pregnant and breastfeeding moms, and organic lotions and potions for babies too. Pamper the new mom in your life with luxurious Earth Mama Body Butter and Natural Stretch Oil to soothe her expanding and itchy tummy. Also shower her with organic teas, lotions, sprays and other soothing products from the Earth Mama Angel Baby organic collection. Get it at Sweet Bottoms Baby Boutique. 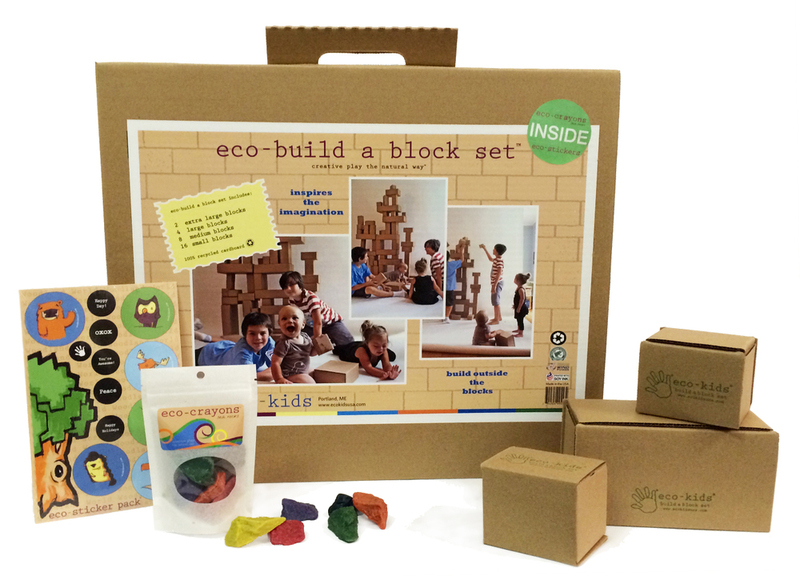 Eco-Kids: Give mom the gift of quality playtime with her child this year. She will enjoy the squeals of joy from her baby, while feeling good knowing her quality baby-mom time wasn’t spent in front of the TV or iPad. We recommend the Eco-Kids line of safe, non-toxic arts and crafts projects for kids of all ages. From eco-dough® and eco-finger paints®, to coloring kits and eco-build a block® sets, there are plenty of things to keep mom and baby entertained and having fun together. You’re not just giving her toys and art supplies; rather, you’re giving her an experience with her child she’ll cherish forever. Get it at Mom’s Milk Boutique. Finding the right gift for the new mom in your life can be an exciting and difficult experience. You want the gift to be thoughtful and special, but also one she will cherish for a long time. By giving her eco-friendly gifts this holiday season, you’ll not only show her you’re thinking of her and her baby, but also that you’re thinking of the world at large. After all, making the world a better place for her baby is the best gift you can give! To purchase any of these eco-friendly children’s gifts, please visit these trustworthy retailers of eco-friendly children’s products. This entry was posted in Blog and tagged earth mama angel baby, eco-friendly gifts, Eco-kids, holiday shopping, Siliconies. Bookmark the permalink.